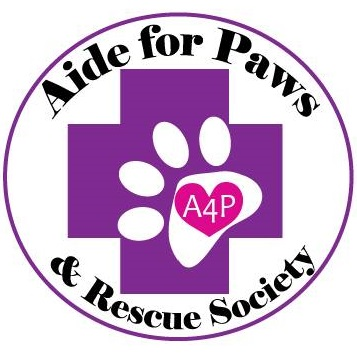 How did you hear about Aide For Paws & Rescue Society? Have you ever fostered an animal with another organization? If yes please list the name(s) of the groups you previously fostered with. Do you agree to have an Aide For Paws member perform a home check visit to ensure your home is appropriate for fostering? Are all members of your Family agreeable to Fostering a Dog/Cat? Have you ever surrendered or given away a pet before? If yes please describe the circumstances. Are you willing to foster a dog/cat of any age? Are you willing to foster a special needs animal? Please describe the type of dog/cat you are willing to foster (Please include breed, coat length, personality traits, energy level, hypoallergenic) We always want to make sure we have the best fit for our foster homes. Are you willing to take your foster dog/cat to vet appointments at a convenient time for you? Are you willing and able to medicate your foster, even if it just a monthly flea preventative? We cannot guarantee a dog to be housebroken, are you willing and able to potty train? What are you plans to exercise your foster? Please list any parks near by or trails, how many walks a day, approximate length, and activities such as agility. If you have other pets in the home please explain how you would introduce them to a new foster animal. Do you have an area in your home where the foster animal can be isolated if necessary? If so please explain. Are you willing to take your foster to obedience/training classes if necessary? Do you give permission for an Aide For Paws representative to contact your veterinarian(s) to vouch for you as a responsible pet owner? Do you give an Aide For Paws representative permission to contact references to vouch for you as a responsible pet owner? I understand that applying does not ensure approval and that untruthful answers or failure to comply with the requirements of this application can result in the forfeiture of any Aide For Paws & Rescue Society animal fostered by me. I understand that by submitting this form electronically, I agree to release and covenant to hold harmless Aide For Paws & Rescue Society and it's members from any claims, damages, costs, or actions incurred because of the care or actions of the foster dog/cat. I accept full responsibility for the dog(s)/cat(s) actions at all times, and release Aide For Paws & Rescue Society from any liabilities or damages that may be incurred because of fostering such dog(s)/cat(s). I agree to have Aide For Paws & Rescue Society complete reference call checks and conduct a home visit inspection to be able to approve my foster application. I agree that if I'm unable to foster the dog(s)/cat(s) anymore that I will return the dog(s) to Aide For Paws & Rescue Society and try to give Aide For Paws & Rescue Society a 2 week period to try and find another suitable foster for the animal(s).